Bryce Aron Max Harper (born October 16, 1992) is an American professional baseball right fielder for the Washington Nationals of Major League Baseball (MLB). Harper was chosen by the Nationals with the first overall pick in the 2010 Major League Baseball Draft. Harper won the 2010 Golden Spikes Award, awarded annually to the best amateur baseball player. Going into the 2012 season, baseball prospect-watchers, including Baseball America, MLB.com, and Baseball Prospectus routinely ranked Harper as a top-3 prospect. He made his MLB debut with the Nationals on April 28, 2012. Harper was selected for the 2012 All-Star Game, becoming the youngest position player to ever be selected. He has been touted as a "five-tool player". Harper won the NL Rookie of the Year Award in 2012. He tied for the NL lead in home runs in the 2015 Major League Baseball season, and was named the National League Most Valuable Player for 2015 by unanimous decision of the Baseball Writers' Association of America. For the 2010 college season, 17-year-old Harper enrolled at the College of Southern Nevada of the Scenic West Athletic Conference (SWAC) in the National Junior College Athletic Association (NJCAA), where he would play catcher. An advantage for Harper in his eventual transition to his professional career was that the SWAC, like MLB, uses wooden bats in conference play. In 66 games, he hit 31 home runs, 98 RBIs, hitting .443/.526/.987 (AVG/OBP/SLG). His 31 home runs shattered the school's previous record of 12. He was named the 2010 SWAC Player of the Year. On June 2, 2010, Harper was ejected from a National Junior College World Series game by home plate umpire Don Gilmore after a called third strike. Harper drew a line in the dirt with his bat as he left the plate, presumably to show where he thought the pitch was. It was Harper's second ejection of the year, and resulted in a two-game suspension. The suspension ended his amateur career, as Southern Nevada lost the game from which Harper was ejected and lost their next game with Harper suspended, which eliminated them from the tournament. Harper won the 2010 Golden Spikes Award. Harper was represented by Scott Boras. Following in Strasburg's footsteps, Harper held out until the very last minute before the deadline. With twenty-six seconds remaining, Harper and the Nationals agreed to a 5-year contract worth $9.9 million, including a $6.25 million signing bonus, and eight semesters of college tuition. When asked about the signing, Nationals President Stan Kasten said, "The truth is, with a full minute to go, Mike and I both thought we were not going to have a deal." Asked what changed in that final minute, Nationals General Manager Mike Rizzo replied, "It was both sides compromising and knowing that we were so close, it would be fruitless not to get a deal done." 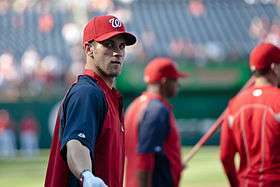 On August 26, 2010, Harper was introduced by the Nationals. Harper said he chose to wear No. 34 because "I always loved Mickey Mantle, three and four equals seven." After batting .319 with a .407 OBP (and leading his team in hits, homers, RBIs and walks) in the Nationals' fall instructional league, Harper was selected to participate in the Arizona Fall League as a member of the Scottsdale Scorpions taxi-squad, the second-youngest player in the history of the league (two days older than when Mets' prospect Fernando Martínez appeared in the league in 2006). He batted .343 and slugged .729. On November 20, Harper and the Scottsdale Scorpions won the 2010 Arizona Fall League Championship. After batting .399 in spring training, the Nationals optioned Harper to the Hagerstown Suns of the Class-A South Atlantic League to begin his minor league career. In April 2011, after a slow start in the minor leagues, Harper visited optometrist Dr. Keith Smithson, who reportedly told him, "I don't know how you ever hit before. You have some of the worst eyes I've ever seen." In his first 20 games after receiving contact lenses, Harper hit .480, collecting 7 home runs, 10 doubles and 23 RBIs. 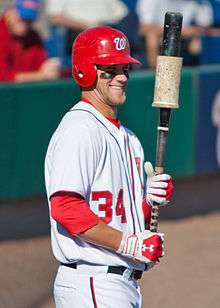 Harper was selected to represent the United States in the 2011 All-Star Futures Game during the 2011 All Star Game weekend. He was promoted to the Double-A Harrisburg Senators on July 4. Harper went 2 for 3 in his AA debut with two singles, a run, and a walk. 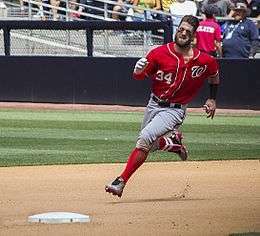 On August 18, 2011, Harper injured his hamstring while running from first to third base on an extra base hit. The injury was severe enough that he had to be carried off the field by his coaches. Harper was placed on the 7-day disabled list, and it was reported that the injury had ended Harper's season. Harper hit two home runs on Opening Day of the 2013 season vs the Miami Marlins. He became the youngest major league player, at age 20, to hit two home runs in his team's first game of the season. He was voted a starter for the MLB All Star Game, his second career All-Star selection. After hitting 13 home runs in just 58 games, Harper was selected to participate in the 2013 Home Run Derby. Harper hit a total of 16 home runs in the first two rounds to advance to the final round, in which he faced Yoenis Cespedes, an outfielder for the Oakland Athletics. Although he lost 9–8 in the finals, Harper was the second-youngest player to participate in the Home Run Derby, and the youngest to ever make it to the final round. Harper hit his 17th homer of the season on August 6 and it was his 39th of his career, passing Ken Griffey Jr. for most home runs by a player younger than 21. Only 2 other players have more home runs than him before turning 21. In 118 games, he hit .274/.368/.486 with 20 HR, 58 RBI and 47 XBH. During the 2013 off-season, Harper successfully underwent left knee surgery to remove a bursa sac. On April 18, 2015, Harper hit the longest home run of his professional career with a 461-foot home run to center field against the Philadelphia Phillies. On May 6, Harper hit three home runs in a single game for the first time in his career against Tom Koehler with one of the shots going 442 feet to the second deck in a 7–5 victory over the Miami Marlins, becoming the youngest player to accomplish this feat since Joe Lahoud in 1969. Harper was later awarded the Player of the Month Award for the month of May for the first time in his career. Measured by adjusted OPS (OPS+) Harper's 2015 was a top 5 hitting season (since 1900) for all players under the age of 23, and the best season of any hitter since Barry Bonds a decade earlier. He also led the majors in WAR and tied for the NL home run title with 42. The National finished the season with a 95-67 record, clinching the NL East division, but lost to the Dodgers in the 2016 NLDS. After the 2016 season, the Nationals have Harper eligible for arbitration until 2018. At the age of 26, Harper will become a free agent for the 2018-2019 season. It has been speculated that Harper may become the first player to sign a contract worth $400 million in sports history. In junior high, Harper was a member of his school's basketball team. Harper's older brother, Bryan Harper, was a left-handed pitcher for College of Southern Nevada with Bryce. Bryan played for the University of South Carolina Gamecocks, back to back winners of the 2010 and 2011 College World Series. Bryan was also selected in the 2010 MLB Draft, by the Chicago Cubs. He did not sign and then was drafted in the 2011 MLB Draft by the Washington Nationals. Harper was featured in an episode of ESPN E:60 and was on the cover of Sports Illustrated in May 2009. Harper featured in another ESPN magazine in 2015, this time displaying naked in ESPN's The Magazine 2015 Body Issue. Harper also received a sponsorship deal with a nutritional supplement company focusing on active lifestyles, MusclePharm. Harper's father, Ron, is an ironworker in Las Vegas. Harper attributes his work ethic to the lessons he learned from watching his father: "I wanted to come out and I wanted to work hard because he worked hard. He did it for over 25 years." Harper is a member of The Church of Jesus Christ of Latter-day Saints. Bryce Harper was one of four nominees up for the 2016 ESPY Award, male athlete of the year, won by Lebron James. In May 2014, Harper proposed to his longtime girlfriend Kayla Varner. Their wedding set for January 2015 did not take place. In July 2016, Varner announced the couple's reconciliation, stating they were engaged to be married again. 1 2 Oliver, Brian (June 7, 2010). "With the first pick". Nationals Farm Authority. Retrieved June 8, 2010. ↑ Comack, Amanda (May 14, 2012). "Bryce Harper hits first major league homer, gets curtain call". The Washington Times. Retrieved May 15, 2012. ↑ "Nationals' Bryce Harper added to NL All-Star team roster". SI.com. Retrieved July 7, 2012. ↑ "An eventful All-Star win for Nats". Csnwashington.com. July 11, 2012. Retrieved August 22, 2012. ↑ Rolfe, Rebecca; Worthington , Dan (July 15, 2013). "Harper at the Home Run Derby". The Washington Post. Retrieved July 17, 2013. ↑ "Harper faces one-game suspension.". ESPN. Retrieved May 11, 2016. ↑ Spotrac.com. "Bryce Harper". Spotrac.com. Retrieved 2016-08-01. ↑ "Scott Boras on possible Bryce Harper extension: 'Really up to the Lerners'". CBSSports.com. Retrieved 2016-08-01. ↑ Muskat, Carrie (June 8, 2010). "Cubs select Bryce Harper's older bro". MLB.com. Retrieved June 10, 2010. ↑ "Chicago Cubs 2010 Draft Results | cubs.com: Team". MLB.com. Retrieved August 17, 2010. ↑ Kelly, Cara (2014-05-31). "Nats' Bryce Harper and Kayla Varner engaged". The Washington Post. ISSN 0190-8286. Retrieved 2016-08-01. ↑ Heil, Helena Andrews-Dyer, Emily; McKellogg, JulieAnn (2015-01-09). "Bryce Harper and Kayla Varner's January wedding didn't happen". The Washington Post. ISSN 0190-8286. Retrieved 2016-08-01. ↑ "Instagram photo by Kayla Varner • Jul 14, 2016 at 6:31pm UTC". Instagram. Retrieved 2016-08-01. ↑ "Bryce Harper and Kayla Varner are engaged … again". Washington Post. Retrieved 2016-08-01.